This book teases out the reasons for, and the socioeconomic impacts of, different types of migration on contemporary rural households and individuals. The author creatively depicts the dynamic microcosm of one village in the North Indian Kumaun Himalayas, near the border with Chinese Tibet, giving voice to the life stories of a range of migrants. Through this ethnography, migration is revealed as a fundamental part of the multifaceted 21st century changes which the village is experiencing. From elderly women, to unemployed men, young farm women and local children, the book demonstrates how village life is continually constituted socially and economically by overlapping migration patterns – including out-migration, return-migration, in-migration and even non-migration. Extending the argument, the author demonstrates that the village microcosm is linked to many other villages which are microcosms in their own right as well as in relation to the main village across a spatial hierarchy. The theoretical implications of the study are teased out to inform our understanding of rural-urban migration trends and impacts more generally, and as such the book will be of interest to researchers of the South Asian region, but also of internal migration in the global context. Madleina Daehnhardt, PhD, is currently Tutor in International Development at the Institute of Continuing Education, University of Cambridge, and Research Advisor at the relief and development NGO Tearfund. 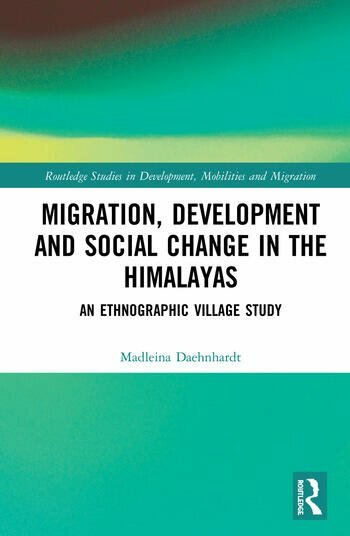 Whilst carrying out the village study presented in this book (2015-2016), Madleina was based at the Centre of Development Studies, Cambridge, and affiliated at the Centre for Public Policy at Doon University in Dehradun, Uttarakhand.